In this article we will cover techniques for finding deer funnels, creating your own funnels, and of course some strategies for effectively hunting the deer making use of these funnels. First lets take this right down to the core and explain exactly what a deer funnel is for those who may be a little sketchy on the term. A funnel is an area of travel that a deer utilizes to safely move between adjoining parcels of land. A funnel can take many shapes. We refer to these areas as funnels for the fact that the deer will follow that shape of the land parcel down to it’s smallest portion making complete use of the cover. There are many visual images to demonstrate the classic funnel but the most popular is course the funnel itself, followed by the hourglass shape and, another term used is the bottleneck. A deer funnel can be a highway of activity for the local deer herd and those nomadic bucks searching for a doe in estrus during the rut. 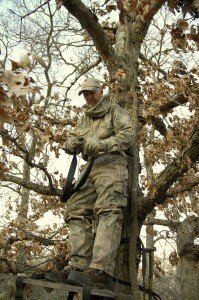 In the most typical situations you will find that all deer in the area will utilize the funnel at one point or another. To capitalize on this opportunity you will first need to recognize a funnel. By far the very best method for finding a funnel is the use of aerial photgraphy. Don’t sweat it, we’re not going to suggest hiring a pilot to get the aerials you need. You can do this for free right from your personal computer in a very simplified manner that should be worked into a majority of your scouting whenever possible. To learn more about retrieving aerial photos of your hunting area see our Scouting At Night article to get started. The reason we suggest using this format for finding funnels is really quite basic. In some instances a funnel can actually be very wide. Take for instance a 100 yard wide expanse of forest connecting two parcles of land that are 40 acres each on both sides. From the ground this may look very minimal but from the air this will definately be observed as a potential deer funnel. The expanse of 100 yards may not be best suited for the archery hunter but for the firearm enthusiast this presents the perfect scenario and a likely hotspot. Thats not to say that a bowhunter should not hunt a funnel of these dimensions. The deciding factor should always be the visible presence of deer movement and deer sign. It is quite plausible that a main deer trail could be running down the center of the funnels expanse. This would afford any type of hunter the opportunity to setup and take advantage of the situation. Smaller funnels are also often overlooked without further investigation. I have found deer trails worn into the ground a full 6 inches where the deer were making use of a single row of immature spruce trees that connected a lowland swamp to a mixed forest setting and alternate similar scenarios. Remember, the deer will utilize ‘anything’ to break up their silhouette just the same as a hunter. Dont negate the fact that this seemingly unappealing stretch of brush could be a travel corridor. A little footwork is all you will need to confirm whether or not this is truely a deer funnel. This also holds true for fencelines like those found on farmlands. Since these fencelines do not receive any type of maintenance, other than the replacement of posts, weeds and grasses grow tight beneath the actual fenceline and around the bases of each post. Again, especially in the dusk or dawn hours, the deer need very little cover to mask their movement between parcels of property. Although this may not fall into the category for consideration as a true funnel, don’t discount the probability for deer movement. A final area of consideration is the type of funnel that would lead to an open field. These could be viewed as many shapes but for this article lets look at this as a triangle pointing out into the field. As with all the other funnels the deer will make use of this added cover as much as possible. In this scenario we take on a different aspect for pursuing these animals as the deer tend to stage before entering the open field. 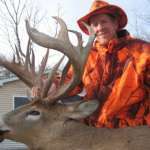 Much the same, you can setup on these deer with this knowledge in mind and we’ll discuss that in the hunting strategies portion of this article. When looking to create your own deer funnel you should take into consideration the main structure of the property before any enhancement begins. The undertakings of the entire project can be as large, or small scale, as needed but the basics will be the same for both procedures. The entire concept is based around the fact that you will be able to provide a workable and sensible travel corridor for the deer in a close approximation of your intended goals. First we would imagine that you are very familiar with the property and understand the basic travels of the current deer herd to some extent. With the travels you would have routed the main trails for the most part and given priority to these main junctions. You should expect some initial negative reaction from the deer in all cases of creating your own funnel since you are in essence re-arranging their home. Creating a major funnel would entail more than a typical one-man-operation of chainsaws and brush cutters. In the overall realm you are probably looking at heavy equipment rentals and possibly hiring a crew of workers. This is ‘not’ something that happens overnight nor will the deer accept and adapt to this change quickly. This is a long term commitment for future hunting and possibly a larger scale land management process. It would be my own suggestion that you consider further land management if in fact the scale of your project falls into this category. The planting of food plots and possible excavation of ground for a watering hole would obviously all be beneficial but they may adversely affect your funnel creating efforts. Lets talk small scale funnel creation since this will pertain to most hunters and can be done, to some extent, on a very limited budget. Let’s strike that last sentence as many funnels can be created with no budget other than that of your own time and tools you already have. As with the larger project you of course want to consider the current layout of your property and the aerial photos mentioned earlier will again serve you well in their purpose. Your second consideration would be your type of hunting and think about the future here. Just because you only hunt archery today doesnt mean that years from now you wont decide to pick up a muzzleloader. You can make accomodations for both in the very same funnel when you plan ahead. Next lets look at prevailing winds for your area during the hunting season. Also consider the direction of sunrise and sunset. It doesnt pay to have the perfect funnel if your staring into a blinding sunset every evening. Lets note your intended entry and exit from the funnel and any current trees that may be suitable for a treestand or effective ground cover that you can either create or leave untouched. All in all you will find this planning process to be very much like advanced scouting efforts. Lets begin by creating the funnel and working outward in both directions taking all the previous mentioned planning and working this into the construction. If you are thinning this particular area to afford a better or closer shot then make the largest width of the funnel approximate your shooting abilities in distance. If your comfort zone is 30 yards with a bow then use that as a benchmark. This way you will ‘always’ be in your effective range. You may find that very little removal of trees or brush is required and this would show the effectiveness of your planning by utilizing your land accordingly. You may also be in the situation where you are required to ‘add’ material to create the actual travel corridor. This is not uncommon. Many hunters will find that deer will hold up in a small patch of timber until after shooting hours. By planting shrubs, saplings, or small trees that are native to the property, you can effectively create a funnel between two parcels of property. If this is the case then realize the fact that you also need an area open of obstruction for a clear shot. Small breaks in the plantings would be the means for that necessary provision. Don’t barricade the deer in with too much cover. A single staggered row will be sufficient and will require pruning in subsequent years to remain effective. Next lets take a forward look at the funnel by moving a pre-determined distance to each side of the actual funnel. It is in your best interest to consider these areas for hunting with firearms and a shooting lane trimmed up to the main trail from the outside edge of the parcel will be sufficient. Again, keep your shooting abilities in mind and your effective range. If this is dictated by your weapon then this would be your benchmark. Let’s say you can only hunt with a shotgun and you are effective up to 75 yards with a slug. Find the area within the main parcel of property where the deer trail is most pronounced. From that trail back to the edge of the parcel should be no more than 75 yards in distance. Confusing? Take a look at the graphic for a better understanding if needed. Having 2 areas like this on each side of the main funnel would provide you with both an archery hunting spot and an opportunity to hunt with the firearm or an alternate archery area. The whole aspect of creating your own deer funnel is extremely rewarding when seen in action. With that in mind, if you’ve done your homework and worked according to your plans you should be sitting pretty good at this point. Now comes the hunting. Hunting a deer funnel is much like any hunting regardless of your choice of weapon. The one aspect that you can usually, not always, count on is that the deer will not be stopping for any great length of time especially in the funnels that are relatively barren of any major structure. Be prepared to make that quick shot when hunting fencerows or the newly laid out funnel that has yet to provide anything more than a travel corridor from one piece of land to another. For the bowhunter, a quick mouth call may be needed to stop the deer for the shot. A simple simulation of a fawn bleat can be made quite easily and has worked many times to stop a deer in it’s track long enough for a shot. For a sample of a fawn bleat see our download section. You can also opt to use scent to get the deer to stop and investigate but my personal experience has shown that the deer will most likely stop way short of the actual scent. If there is one drawback to hunting funnels of this nature, then the typical movement of deer would be it. Funnels that expand a greater shooting range, such as that observed by the firearm hunter or an archery hunter with a wider funnel, typically lend themselves to a calmer class of deer. These deer tend to browse and stop often before progressing towards the actual funnel or bottleneck. For the most part this seems to be true regardless of which side of the funnel you are hunting. Deer that have already used the funnel feel they now have some cover and a quick escape route into the thicker forest. They will exhibit the characteristic of laying back their ears in the direction of the funnel to check their backtrail for approaching danger. Browsing again becomes evident as the deer relax. This is the effectiveness of hunting to either side of the funnel and viewing these characteristics tells you that the deer’s focus is elsewhere. Just what you wanted. There is no real means to a strategy here. The funnel has done the work for you and now it’s your turn to make the shot. Hunting funnels that taper into a field provide an added element and a slightly different approach. Deer will tend to stage, or hang-up, before entering an open field. In many cases it is the buck who exhibits the added caution and rightfully so. Although we can only interpret what a deer’s action really means, many hunters claim the buck will watch the doe in the field and observe from a distance the possible danger. Regardless of whether or not this is speculative, it is a habituary trait in many bucks. Or so it seems. In true fact most deer, doe and buck alike, will stage at the edge of a field. Keep in mind that it isnt only hunters that make the deer wary. Predators keep the deer on their hooves year round and dropping their guard simply is not in their best interest. Suggested techniques for hunting this type of funnel would of course be to setup further back on the funnel. This can be a hit or miss situation in terms of how far back to create your setup. Unless there are well defined trails leading to the field that may dictate the movement, I would suggest beginning at the base of the funnel where it meets the main portion of the woods. Many times deer will walk to the edges of this funnel well before its furthest point. This tends to create more of an erratic pattern and less visual notice of primary trails. Regardless, the deer will dictate the staging area where most deer will stop, possibly browse, and watch through the trees before entering the field. Scent checking the air and visual acknowledgement between the deer may be noticed in greater succession in this area but this is typically where you will get a shot at that larger buck. It is also unfortunately one of the tougher areas to get a shot off without getting busted. At the very tip of the funnel, just before it enters the field, is where most hunters tend to hang a treestand especially when a well used deer trail is present. This can be very effective but keep in mind that the deer will likely be very cautious. Once in the field the deer will tend to browse along in no particular fashion. This can make for tough hunting in terms of the archery hunter. A deer can quickly walk out of range in this scenario and an alert deer in the field will send up the warning signals to the deer back in the staging area. As a matter of preference I would rather have a firearm in this situation where you could setup ‘away’ from the funnel yet hunt the effectiveness produced by that funnel. If possible I would create the setup directly in front of the funnel from a respectable shooting distance. This will allow you to also view both sides of the funnel in the event a deer chooses not to follow through right to the end. Setting up on either side of the funnel could lend itself to a lot of missed action escpecially during the rut when the bucks are chasing the does. In the end it doesnt matter what type of funnel you may be hunting. Man-made funnels or one of natures own creations, theyre the same in order of effectiveness. Think of the deer funnel as an on-ramp to the road of your next destination and you could be driving back home after another successful hunt.